Also serving communities of Pomona Park, Welaka, Crescent City. There are 7 Assisted Living Facilities in the Palatka area, with 5 in Palatka and 2 nearby. The average cost of assisted living in Palatka is $2,650 per month. This is lower than the national median of $3,346. Cheaper nearby regions include Green Cove Springs with an average starting cost of $2,500. To help you with your search, browse the 14 reviews below for assisted living facilities in Palatka. On average, consumers rate assisted living in Palatka 4.6 out of 5 stars. Caring.com has helped thousands of families find high-quality senior care. To speak with one of our Family Advisors about assisted living options and costs in Palatka, call (855) 863-8283. The city of Palatka is located in northeast Florida on the bend of the St. John River. Key events in Palatka highlight its history throughout the year. Festivals featuring azaleas, catfish, crab, and blueberries and the Palatka Mural Tour, showcasing city artwork, draw crowds of all ages. There are eight assisted living facilities in the Palatka area, five within the city limits. The Bureau of Health Facility Regulation manages assisted living facilities throughout the state of Florida, and it has ordained that assisted living communities be run as residential communities that provide supportive services, rather than as medical facilities. So, seniors in the state have residences that feel more like a home than a senior care center, making retirement in Florida inviting for seniors. The weather in Palatka is ideal for seniors who like a warmer climate. The area enjoys a July high temperature of 92 degrees Fahrenheit and 223 sunny days a year, along with a winter lowest temperature of 44 degrees Fahrenheit in January. The cost of living in the city of Palatka is below the national average score of 100, coming in 20 points lower with a score of 80. Most of this savings is in the housing sector, with a remarkable score of 37. Health care is also slightly less expensive than the national average, scoring 93. Groceries and transportation clock in near the average. Crime is a severe problem in the city, with scores well above the U.S. average. Violent crime is nearly three times worse in Palatka than in the U.S. as a whole. Property crime is more than two times worse. Seniors considering moving into Palatka should avoid high crime neighborhoods. The Palatka area has few facilities from which to choose in the event of a medical emergency or illness, with the nearest major hospital located in Jacksonville. Social security income is not taxed in the state of Florida, so seniors considering a move to the Palatka area can save while residing in an assisted living facility there. Transportation is managed by Ride Solution in the city of Palatka. There is only one scheduled trip per day. The bus service's website is intermittently down, and the service is poorly rated. Assisted Living costs in Palatka start around $2,650 per month on average, while the nationwide average cost of assisted living is $4,000 per month, according to the latest figures from Genworth’s Cost of Care Survey. It’s important to note that assisted living rates in Palatka and the surrounding suburbs can vary widely based on factors such as location, the level of care needed, apartment size and the types of amenities offered at each community. 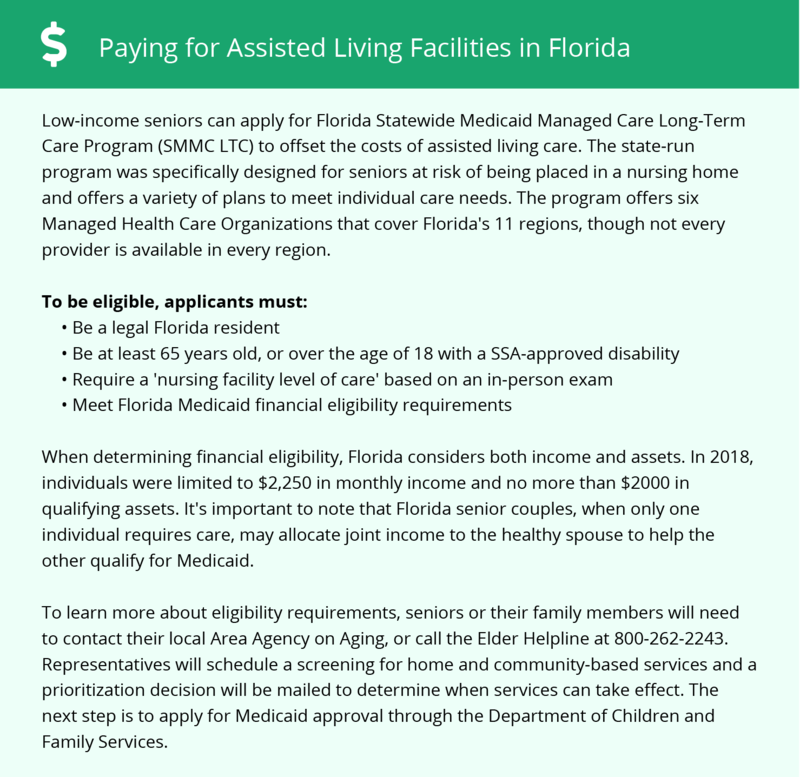 Seniors who live in assisted living facilities in semi-private or private rooms have access to funding help through Florida's 1915(b)(c) MLTC program. Residents who live in ALFs can get help paying for the services provided through the Assistive Care Services program. Seniors who can't afford the full price of room and board in ALFs can get assistance through the OSS payment in the state of Florida. Seniors can also get help through Family Supplementation for costs beyond the OSS payment. To see a list of free assisted living resources in Palatka, please visit our Assisted Living in Florida page. Palatka-area assisted living communities must adhere to the comprehensive set of state laws and regulations that all assisted living communities in Florida are required to follow. Visit our Assisted Living in Florida page for more information about these laws.